German company Fresh Nuts has used invisible code on its retail-ready pallet displays to communicate with customers. The company produces and sells mixed nuts and dried fruits worldwide with its products primarily available for more than 40 years at ethnic markets. 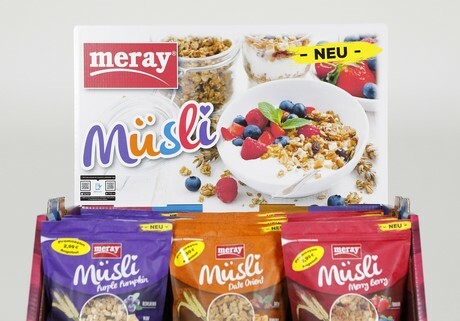 Using its Meray brand, Fresh Nuts launched four different muesli flavour profiles, a product previously unseen on the ethnic market. The campaign was supported by tastings at the point of sale as well as intelligent displays. The pallet displays, developed by Thimm, feature a topper, base, cross bracing, divider bars and four trays. Each of the elements was produced using digital web press technology. The intelligence portion of the display comes through the digital watermarks printed on the topper and base, which are invisible to the human eye. The codes can be read using the free LinkReader application for internet-connected iOS and Android smartphones. The first of the 1/4 Chep pallet displays hit European retailers in October. Potential customers who scan the topper or base are presented directly with informational or advertising videos for the new muesli. This can have a decisive influence on purchasing decisions at the point of sale. Mobile devices are increasingly becoming digital communications instruments, combining reality with the virtual world.